Additional camera for SEW-3036 monitor only. The camera features: two way audio function, night light and true IR night vision. The Samsung SEB-1019RWP/UK Indoor Network IP Camera with non-visible IR LEDs ensure safe night time monitoring. 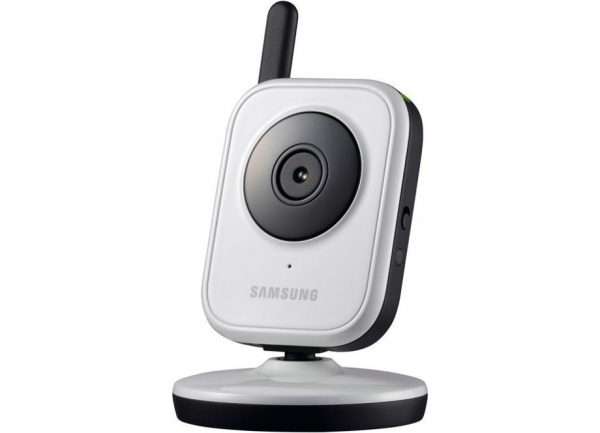 The Samsung SEB-1019RWP/UK Indoor Network IP Camera features VGA (640x480) resolution to provide crisp and clear image and built-in mic and speaker of the camera allows two-way talk and you can talk to and hear your baby. The Samsung SEB-1019RWP/UK Indoor Network IP Camera is designed to work alongside the Samsung SEB-3036 baby camera. VGA (640 x 480) resolution to provide crisp and clear image. Non-visible IP LEDs for safe night time monitoring. Built-in mic and speaker for two-way talk.